Digging out invasive herbs can be challenging when you see hundreds of well-rooted forbs (another name for herbs) growing throughout the landscape. Start in early spring (April for Long Island) when the ground is damp and growth is just appearing. 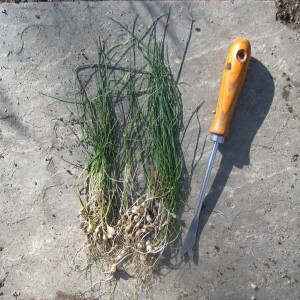 First, identify the plant species by its leaves, flowers, and roots. Then begin from the outside of a patch and work inward. Pace yourself by eradicating a small section at a time. Use the right tool at the right time while applying the right disposal method. For small plants you will want a small digging tool like a V blade weeder or a 3-claw hand weeder — a large screwdriver will even work in a pinch. For deeper roots, a trowel or spade will help. 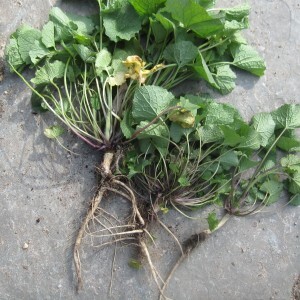 However, in very loose soil, the plants can be pulled out by grabbing the stems as close to the ground as possible, and wiggling and gently but firmly pulling. Sheet mulching — laying corrugated cardboard, wood chips and compost over a weeded area, over Japanese stiltgrass or an unwanted lawn — will deprive the soil of sunlight while retaining moisture. Cardboard can hold its integrity under compost and mulch for up to 4 months, which is plenty of time to kill the grass and most weed’s root systems. Seed on or plant directly into the mulch. A garden will be nearly weed free if mulch is added annually. 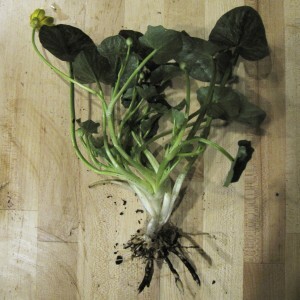 When done, plants in flower (garlic mustard in 2nd year) and/or their bulbs (wild garlic for example), tubers (for lesser celandine) should be bagged, solarized, and disposed — not left in place or home composted as they will continue to produce seed and re-root.